To return link click the return arrow to come back to the top of the page. How to do a Pulse Check. Click on the image on the left to view the NICE Quick reference guide. Management of hypertension in adults in primary care. Having high blood pressure is one of several 'risk factors' that can increase your chance of developing heart disease, a stroke, and other serious conditions. As a rule, the higher the blood pressure, the greater the risk. Treatment includes a change in lifestyle risk factors where these can be improved - losing weight if you are overweight, regular physical activity, a healthy diet, cutting back if you drink a lot of alcohol, stopping smoking, and a low salt intake. If needed, medication can lower blood pressure. Blood pressure is the pressure of blood in your arteries (blood vessels). Blood pressure is measured in millimetres of mercury (mmHg). Your blood pressure is recorded as two figures. For example, 150/95 mmHg. This is said as '150 over 95'. The top (first) number is the systolic pressure. This is the pressure in the arteries when the heart contracts. just a high systolic pressure, for example, 170/70 mmHg. just a high diastolic pressure, for example, 120/104 mmHg. or both, for example, 170/110 mmHg. However, it is not quite as simple as this. Depending on various factors, the level at which blood pressure is considered high enough to be treated with medication can vary from person to person. This is definitely high. All people with a blood pressure that stays at this level are usually offered medication to lower it (described later). damage to the heart or kidney (organ damage) due to high blood pressure. Have developed a complication of diabetes, especially kidney problems. Have had a serious cardiovascular event such as a heart attack, TIA or stroke. Have certain chronic (ongoing) kidney diseases. A one-off blood pressure reading that is high does not mean that you have 'high blood pressure'. Your blood pressure varies throughout the day. It may be high for a short time if you are anxious, stressed, or have just been exercising. You are said to have 'high blood pressure' (hypertension) if you have several blood pressure readings that are high, and which are taken on different occasions, and when you are relaxed. If one reading is found to be high, it is usual for your doctor or nurse to advise a time of observation. This means several blood pressure checks at intervals over time. The length of the observation period varies depending on the initial reading, and if you have other health risk factors. For example, say a first reading was mildly high at 150/94. If you are otherwise well, then a period of several months 'observation' may be advised. A blood pressure reading may be taken every few weeks. The observation period is also a good time to change any lifestyle factors that can reduce blood pressure (see below). If the blood pressure readings remain high after an observation period then treatment with medication may be advised, depending on your risk factors (see below). However, if you have diabetes, or have recently had a heart attack or stroke, you may be advised to have blood pressure checks fairly often over the next week or so. Also, treatment with medication is usually considered at an earlier stage if the readings remain high. Some people are given (or buy) machines to monitor blood pressure at home (home monitoring) or when they are going about doing their everyday activities (ambulatory monitoring). One reason this may be advised is because some people become anxious in medical clinics which can cause the blood pressure to rise. (This is called 'white coat' hypertension.) Home or ambulatory monitoring of blood pressure may show that the blood pressure is normal when you are relaxed. This is called 'essential hypertension'. The pressure in the arteries depends on how hard the heart pumps, and how much resistance there is in the arteries. It is thought that slight narrowing of the arteries increases the resistance to blood flow, which increases the blood pressure. The cause of the slight narrowing of the arteries is not clear. Various factors probably contribute. It is then called 'secondary hypertension'. For example, certain kidney or hormone problems can cause high blood pressure. with diabetes. About 3 in 10 people with Type 1 diabetes and more than half of people with Type 2 diabetes eventually develop high blood pressure. with a family history of high blood pressure. with certain lifestyle factors. That is, those who: are overweight, eat a lot of salt, don't eat many fruit and vegetables, don't take enough exercise, or drink a lot of alcohol. A urine test to check if you have protein or blood in your urine. A blood test to check that your kidneys are working fine, and to check your cholesterol level and sugar (glucose) level. A heart tracing (an electrocardiogram, also called an ECG). Rule out (or diagnose) a 'secondary' cause of high blood pressure such as kidney disease. To check to see if the high blood pressure has affected the heart. To check for other 'risk factors' such as a high cholesterol level or diabetes (see below). Who should have a blood pressure check? High blood pressure usually causes no symptoms. You will not know if you have high blood pressure unless you have your blood pressure checked. Therefore, everyone should have regular blood pressure checks at least every 3-5 years. The check should be more often (at least once a year) in: older people, people who have had a previous high reading, people with diabetes, and people who have had a previous reading between 130/85 and 139/89 mmHg (that is, not much below the 'cut off' point for high blood pressure). Why is high blood pressure a problem if it causes no symptoms? High blood pressure is a 'risk factor' for developing a cardiovascular disease (such as a heart attack or stroke), and kidney damage, sometime in the future. If you have high blood pressure, over the years it may have a damaging effect to arteries and put a strain on your heart. In general, the higher your blood pressure, the greater the health risk. But, high blood pressure is just one of several possible risk factors for developing a cardiovascular disease. Cardiovascular diseases are diseases of the heart (cardiac muscle) or blood vessels (vasculature). However, in practice, when doctors use the term 'cardiovascular disease' they usually mean diseases of the heart or blood vessels that are caused by atheroma. Patches of atheroma are like small fatty lumps that develop within the inside lining of arteries (blood vessels). Atheroma is also known as 'atherosclerosis' and 'hardening of the arteries'. Cardiovascular disease that can be caused by atheroma include: angina, heart attack, stroke, transient ischaemic attack (TIA), and peripheral vascular disease. In the UK, cardiovascular diseases are a major cause of poor health and the biggest cause of death. Lack of physical activity (a sedentary lifestyle). High trigliceride (fat) blood level. Kidney diseases that affect kidney function. A strong family history. This means if you have a father or brother who developed heart disease or a stroke before they were 55, or in a mother or sister before they were 65. An early menopause in women. Age. The older you become, the more likely you are to develop atheroma. Ethnic group. For example, people who live in the UK with ancestry from India, Pakistan, Bangladesh, or Sri Lanka have an increased risk. However, if you have a fixed risk factor, you may want to make extra effort to tackle any lifestyle risk factors that can be changed. Note: Some risk factors are more 'risky' than others. For example, smoking and high blood pressure cause a greater risk to health than obesity. Also, risk factors interact. So, if you have two or more risk factors, your health risk is much more increased than if you just have one. For example, a middle aged male smoker who takes no exercise and has high blood pressure has a high risk of developing a cardiovascular disease such as a heart attack before the age of 60. Therefore, the benefit of lowering a high blood pressure is to reduce the risk of developing a cardiovascular disease in the future. For example, it is estimated that reducing a high diastolic blood pressure by 6 mmHg reduces your relative risk of having a stroke in the future by about 35-40%, and reduces your relative risk of developing heart disease by about 20-25%. Larger reductions in blood pressure provide greater benefits. A drug to lower blood pressure if it is 140/90 mmHg or higher. A drug to lower your cholesterol level. A daily low dose of aspirin. This reduces the risk of blood clots forming in the blood vessels over patches of atheroma (which cause strokes and heart attacks). Where relevant, to encourage you to tackle 'lifestyle' risk factors such as smoking, lack of physical activity, diet, and weight. How can blood pressure be lowered? There are two ways in which blood pressure can be lowered. Modifications to lifestyle (weight, exercise, diet, salt, and alcohol) if any of these can be improved upon (details below). Losing some excess weight can make a big difference. Blood pressure can fall by up to 2.5/1.5 mmHg for each excess kilogram which is lost. Losing excess weight has other health benefits too. If possible, aim to do some physical activity on five or more days of the week, for at least 30 minutes. For example, brisk walking, swimming, cycling, dancing, etc. Regular physical activity can lower blood pressure in addition to giving other health benefits. If you previously did little physical activity, and change to doing regular physical activity five times a week, it can reduce systolic blood pressure by 2-10 mmHg. Use herbs and spices to flavour food rather than salt. Limit the amount of salt used in cooking, and do not add salt to food at the table. Choose foods labelled 'no added salt', and avoid processed foods as much as possible. AT LEAST five portions, and ideally 7-9 portions, of a variety of fruit and vegetables per day. THE BULK OF MOST MEALS should be starch-based foods (such as cereals, wholegrain bread, potatoes, rice, pasta), plus fruit and vegetables. NOT MUCH fatty food such as fatty meats, cheeses, full-cream milk, fried food, butter, etc. Use low fat, mono-, or poly-unsaturated spreads. INCLUDE 2-3 portions of fish per week. At least one of which should be 'oily' such as herring, mackerel, sardines, kippers, pilchards, salmon, or fresh (not tinned) tuna. If you eat meat it is best to eat lean meat, or poultry such as chicken. If you do fry, choose a vegetable oil such as sunflower, rapeseed or olive oil. A healthy diet provides health benefits in different ways. For example, it can lower cholesterol, help control your weight, and has plenty of vitamins, fibre, and other nutrients which help to prevent certain diseases. Some aspects of a healthy diet also directly affect blood pressure. For example, if you have a poor diet and change to a diet which is low-fat, low-salt, and high in fruit and vegetables, it can lower systolic blood pressure by up to 11 mmHg. A small amount of alcohol (1-2 units per day) may help to protect you from heart disease. One unit is in about half a pint of normal strength beer, or two thirds of a small glass of wine, or one small pub measure of spirits. However, too much alcohol can be harmful. Cutting back on heavy drinking improves health in various ways. It can also have a direct effect on blood pressure. For example, if you are drinking heavily, cutting back to the recommended limits can lower a high systolic blood pressure by up to 10 mmHg. When is drug treatment started for high blood pressure? All people who have a blood pressure that remains at 160/100 mmHg or above after a trial of any lifestyle changes, where relevant. A 2 in 10 risk (or more) of developing a cardiovascular disease within the next 10 years (as described above). People with a blood pressure of 130/80 mmHg or more who have certain diseases. For example, people who have certain complications from diabetes, people who have had a recent heart attack, stroke or TIA (transient ischaemic attack). Also, some people with certain chronic (ongoing) kidney diseases. What is the target blood pressure to aim for? If you are otherwise well but are diagnosed with high blood pressure then the target is to reduce blood pressure to below 140/85. This target generally applies to people who have a 2 in 10 risk (or more) of developing a cardiovascular disease within the next 10 years but who have not developed any disease. People who have a cardiovascular disease. People who have a chronic kidney disease. Your GP or practice nurse will advise you what your target blood pressure is. What drugs are used to lower blood pressure? There are several drugs that can lower blood pressure. The one chosen depends on such things as: if you have other medical problems; if you take other medication; possible side-effects of the drug; your age; your ethnic origin; etc. Some drugs work well in some people, and not so well in others. One or two drugs may be tried before one is found to suit. One drug reduces high blood pressure to the target level in less than half of cases. It is common to need two or more different drugs to reduce high blood pressure to a target level. In about a third of cases, three drugs or more are needed to get blood pressure to the target level. In some cases, despite treatment, the target level is not reached. However, although to reach a target level is ideal, you will benefit from any reduction in blood pressure. How long is medication needed for? In most cases, medication is needed for life. However, in some people whose blood pressure has been well controlled for three years or more, medication may be able to be stopped. In particular, in people who have made significant changes to lifestyle (such as lost a lot of weight, or stopped heavy drinking, etc). Your doctor can advise. If you stop medication, you should have regular blood pressure checks. In some cases the blood pressure remains normal. However, in others it starts to rise again. If this happens, medication can then be started again. Smoking does not directly affect the level of your blood pressure. However, smoking greatly adds to your health risk if you already have high blood pressure. If you smoke, you should make every effort to stop. If you smoke and are having difficulty in stopping, then see your practice nurse for help and advice. The heart rate of most adults is between 60 and 90 beats a minute (bpm), usually fractionally higher in women, and it's thought that anything above 100bpm when at rest is cause for concern (you can measure your heart rate by taking your pulse, although an ECG is the most accurate method). Heart rates are a useful way of assessing physical fitness: those who take hard exercise are likely to have much lower rates than couch potatoes and the obese. A good indicator is to work out your maximum heart rate (MHR), which is the fastest rate your heart can reach when exercising. It declines with age - a 20-year-old's is likely to be 200bpm, and a 60-year-old's 160bpm. The number crunch: To work out your MHR, subtract your age from 220, eg 220-55 is 165. Your target rate while exercising should be no higher than 60 to 75% of the figure you have calculated. You can also buy heart monitors from sports shops which will do the measuring for you. What is a normal heart rhythm? The normal electrical pattern of your heart is called sinus rhythm. The sinus node is your heart’s natural pacemaker. By producing an electrical impulse, the sinus node makes your atria – or your heart’s top chambers – contract and push blood through to the ventricles – the lower chambers. When the impulses reach the ventricles, they contract to push the blood out of the heart and into the lungs and the rest of the body. These electrical impulses cause your heart to beat. 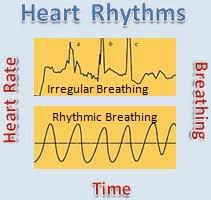 Heart rhythm is the regularity of these beats and heart rate is their speed, or how quickly your heart is beating. When you’re resting, your heart’s natural pacemaker produces 60 to 100 beats per minute (bpm). It is your heart pumping blood that produces your pulse. You can measure the rate and rhythm of your heart by taking your pulse. Palpitation means you can ‘feel’ your heart beat, - it may be beating normally, quickly, slowly or irregularly or sometimes it feels like it's skipping beats. Although they can feel unpleasant, they’re usually harmless and do not mean anything is wrong with the heart. Sometimes palpitations are due to an ectopic beat, feeling anxious, stressed or very tired. Caffeine, smoking and excess alcohol can also cause palpitations. Sometimes palpitations can be an abnormal heart rhythm. Put simply, an ectopic beat is an ‘extra’ beat caused by an extra electrical charge being released. Sometimes there is a short pause after the extra beat, which makes it feel like your heart has missed a beat. Ectopic beats are very common and often you'd be unaware you had experienced one. They’re often caused by anxiety, stress, being tired, smoking, alcohol and caffeine. Avoiding coffee, cigarettes and alcohol can help, and reducing stress will help to reduce the number of ectopic beats that you’re experiencing. Sometimes ectopic beats can indicate an underlying problem with your heart. They are usually harmless and do not need any treatment. What is tachycardia and bradycardia? Sometimes the heart will beat faster or more slowly than average: This depends on the individual make up of a person and many other things, such as if someone is active or resting. Sinus bradycardia means the heart is beating slowly, less than 60 bpm. These are normal heart rhythms and are usually harmless. What is an abnormal rhythm? The electrical impulses are coming from the sinus node, but going to the bottom of the heart by an unusual path. The most common arrhythmia is Atrial Fibrillation. This means that the electrical impulses running through the heart have been delayed or disrupted. These are graded according to severity and the need for treatment. First degree heart block is usually left untreated, but a third degree heart block may require a pacemaker to be fitted. What is a Bundle Branch Block? This is an unusual pattern that shows up on an ECG reading and means there is a slight delay on the electrical impulses to the heart’s two pumping chambers – the right and left ventricle. While bundle branch block does not usually cause any problems it can indicate underlying heart disease and may lead to further tests being carried out. How are heart rhythm problems diagnosed? Your doctor will listen to your heart through a stethoscope and ask you about your symptoms. They may then ask you to have an ECG – or an electrocardiogram. Why is it important to check my pulse? Checking your pulse allows you to check that your heart rhythm is regular. It’s can also help to detect atrial fibrillation – an abnormal irregular heartbeat. Atrial fibrillation (AF) occurs when the upper chambers of the heart - the atria - beat irregularly and often rapidly. This can lead to the formation of blood clots that enter the blood stream and block circulation to the brain, causing a stroke. AF might cause you to have symptoms, such as shortness of breath, dizziness or light headedness, and/or tiredness. Some people have palpitations – this means you can ‘feel’ your heart beat, - it may be beating normally, quickly, slowly or irregularly or sometimes it feels like it's skipping beats. Many people don’t have symptoms from AF but it can be detected by performing a pulse check. If you think you have AF tell your doctor or nurse so that it can be diagnosed, treated and monitored. There are other causes for irregular heart rhythm and rate besides AF, so see your doctor or nurse if you have symptoms. A pulse check is simple and easy to do. Every heartbeat creates a wave of pressure as blood flows along the arteries. Where these arteries lie close to the surface, this pressure wave can be felt as a pulse. Checking your own pulse allows you to determine your heart rate and rhythm without any special equipment. Once you’ve mastered the technique of checking your pulse, teach your friends and family. First, get a a clock or watch with second hand or display. Step one: The pulse on the inside of your wrist is called the radial pulse. Use your right index and middle finger to check the pulse on your left arm. If you are left-handed, use your left index finger and middle finger to check the pulse on your right arm. Use the pads of these fingers and place these just below the wrist creases at the base of the thumb. Step two: Press the radial artery that you are trying to feel with your index finger and feel the pulsation (blood pulsing under your fingers) with your middle finger by gently touching the skin whilst maintaining a firm pressure with your index finger. If necessary, move fingers around until you feel the pulse. Step three: As soon as you feel the pulsations, look at your clock or watch and start counting the number of pulsations and continue to count for one full minute. Step four: A normal pulse rate is between 60 to 100 beats per minute. Your pulse might be higher if you have a high temperature or fever. Athletes might have a pulse as low as the 40s, but this is considered normal. Step five: Besides the number of pulsations, you should also check the rhythm or regularity of the pulse. A normal pulse is strong and regular. An irregular pulse may mean that you have a heart rhythm problem, such as atrial fibrillation. If your pulse is irregular or if it is too fast or slow, notify your doctor or nurse. Top tip! Don’t use your thumb if checking someone else’s pulse, as your thumb has its own pulse. Heart disease is one of the biggest killers in the developed world. Having high blood pressure is one of the factors that contributes to heart disease. It is often called the silent killer, because it produces no specific symptoms if you have it. So, why is high blood pressure so bad for you, and why is it so dangerous for your heart? If you have normal blood pressure, you have a reading that is about 120 over 70 when you visit your GP for a routine check up. This means that the force of the left ventricle of the heart pushes blood out into the body with a pressure of 120 millimetres of mercury. The right ventricle pumps at the lower pressure of 70 millimetres of mercury because it pumps blood only from the heart to the lungs, which is not as far. If you have high blood pressure, your blood vessels tend to be a bit narrower and it takes more effort for your heart to push blood around the body. The heart has to work a lot harder, and push out the blood with more force. If you have high blood pressure, your reading at the GP can be something like 160 over 100, which shows the extra pushing that the ventricles are doing with each individual heart beat. The trouble is that the heart compensates to push round the body with much more force, but it usually overdoes things. Blood that gets to important organs such as the kidneys is at far too high pressure and the delicate parts of these important organs get damaged. The kidney is very prone to damage, and can fail. The eyes are also susceptible and the continued high pressure causes fatty plaques to build up on the inside of the arteries, causing further narrowing of the major blood vessels. The process by which arteries narrow and fatty plaques build up inside them is called atherosclerosis, or hardening of the arteries. High blood pressure is not the only cause. A bad diet, high in saturated fats and cholesterol provides the excess fat in the blood that sticks more easily to the inside of the arteries, but high blood pressure makes it much more likely that that will happen. Sometimes, people who have a very healthy lifestyle develop high blood pressure because of genetic factors and they need drugs to help control their blood pressure and keep it within normal limits. Many other people would have normal blood pressure if their lifestyle was not so unhealthy. Being overweight or obese is one of the things that make it much more likely that you will have high blood pressure. To try to avoid it, it is best to eat a healthy diet, low in fat and high in fresh fruit and vegetables, and to do plenty of exercise on a regular basis. It is also important to cut down on excess salt in the diet, which means avoiding highly processed foods as these tend to be high in salt as well as excess fat. If these measures don’t work successfully, then your doctor will suggest that you use drugs to lower your blood pressure. New drugs have been developed in recent years, such as the ACE inhibitors, which are more specific and have less undesirable side effects. What is an ectopic beat? Ectopic beats are early (premature) or extra heartbeats, which can cause you to have palpitations. ‘Ectopic’ means out of place. Ectopic beats happen when cells away from your hearts own natural pacemaker get a little excited (or irritable) and release an electrical signal, causing an ‘extra’ or early heartbeat. There is often a tiny pause after the extra beat, giving you the sensation of a ‘missed’ beat. The two most common types of ectopic beats are: • premature atrial contraction (PAC) - an early electrical impulse in the atria, which are the upper chambers of your heart • premature ventricular contraction (PVC) - an early electrical impulse in the ventricles, which are the lower chambers of your heart. Like most causes of palpitations, ectopic beats are usually harmless and do not mean you have a serious heart condition. They generally require no treatment unless they occur very often or are very severe. Palpitations and ectopic beats are usually nothing to worry about. The cause is often unknown - or ‘idiopathic‘. However, you are more likely to feel palpitations if you have a heart condition, such as an abnormal heart rhythm (arrhythmia). They can also be caused by a chemical imbalance in your body such as a low blood potassium level, or injury to the heart muscle such as a heart attack. Stimulants such as these can trigger palpitations: • alcohol • caffeine • certain medicines (both prescription and over-the-counter) • recreational drugs • tobacco. You are also more likely to develop palpitations or ectopic beats if you are pregnant, or going through the menopause.